During my internship program I tried to gather as much as information as possible to illustrate a clear-cut image abut the importance of the merchandising and marketing section for the export oriented garments and the value of the merchandiser for the garments industry. The guiding principle of the company is to develop and maintain strong, secure relation with buyers and suppliers. To read the report we will able to know clear image about the importance of the merchandising and marketing section for the export oriented garments and the responsibilities of a production coordinator. The study will also help us to understand the roll of readymade garments in socio economic development of the country. A justified sampling method is used for the purpose of the study. 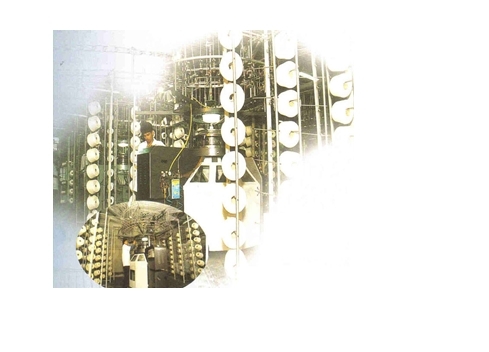 The export oriented ready-made garments sector in Bangladesh plays important in economic development. Now a day million of people are working in this sector. At present the market share of this sector is large among the total export oriented product. The total number of garments industry is increasing day by day. And the workers of this sector are increasing rapidly. At present the number of garments worker is increasing day by day. Most of the employees are illiterate. But this garments sector is flourishing day by day, because the buyers are satisfied with our garments product. For more development of this sector need more learned people. For this reason I have chosen garments sector. During my internship I have faced some limitations to accomplish my report. I could not get much information from the Lyric Garments due to their limitations as well. 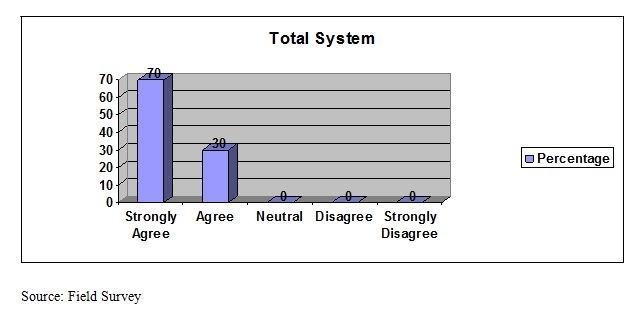 Most of the data are primary data that are difficult to collect. Data sources are so limited. Language scale of research was not possible due to time constraint. The Buyers are very busy. The Exporters are also busy with their duties and responsibilities. Most of the organizations key personnel were too busy. So they did not give me enough time regarding this matter. Due to long distance between the factory and university campus it was very difficult to communicate and meet with the supervisor. Lyric Garments head office is located in Mailbag one of the industrial cities of Bangladesh. Having an area of about 3, 30,000 sft, with an employment of over 4500 people. 100% of the products are exported to the European market. The annual salable product of the proposed project based on three-shift operation per day of 8(eight) hours each shift and working for 300 days in a year both for Knitting and Dyeing & Finishing unit and Garments section is 10 hours per day at 100% capacity. The mission of Lyric Garments of Companies Ltd is to earn foreign exchange for the country through manufacturing and export of high quality apparel. Besides this, each of the company’s activities must benefit and add value to the common wealth of the society. The company firmly believes that in the final analysis it should be accountable to each of the constituents with whom it interacts, namely: the company’s employees, its business associates, its fellow citizens and its shareholders. The company has established itself as a fabric & garments manufacturer off repute with a customer profile that includes some of the best names in business. The company sees itself not merely as a supplier of fabric and garments but as an integral business partner in the value chain of eminent buyers and retailers worldwide. It is well known to the company that in the volatile world of quote free access, winners would be decided based on their international competitiveness. This company would continue to innovate with new and better varieties of fabrics and garments, upgrade the quality of its product and thereby widen its potential range of end users and customers, offer goods within the lowest lead time for enhanced customer satisfaction. To ceaselessly pursue manufacturing efficiency and rationalization of costs and nature as well as develop talent of its people. The project will be a Composite unit consisting Knitting unit, Fabric dyeing & finishing unit and Garments unit. The product of spinning unit i.e. 24/1, 26/1 & 30/1&40/1 combed or card yang material for knitting unit, Various kinds of Dyes and Chemicals like as Reactive Dyes, Salt, Caustic Soda, Soda ash, Wax, Hydrogen Per-Oxide, Detergent, Softener agent etc will be the basic raw material for its fabric dyeing and Finishing unit, which will be imported. The Dyed and Bleached fabrics are the basic raw materials of its Garments unit, which will be received from its dyeing and finishing unit. From the detail analysis, it seems that the Lyric Garments technically feasible, economically & commercially rewarding and financially viable. After implementation of the project will generate direct employment of .25 & persons. All the above measures of investment feasibility of the project indicate that it will be able to generate sufficient revenue from its operation to pay back debt obligation and annual operational expenses. The project is financially desirable & suitable for Bank Financing. Hard work, sincerity, honesty, integrity and devotion of its proud members to its purpose have rewarded the company a reputation of being a largest quality manufacturer in the field of garments sector. This was possible due to the company’s coordinated management and decade’s potential expertise in the manufacturing technology. Factory & Head Office: Chowdhurypara, Malibag, Dhaka, Bangladesh. Product Range: T-shirt, Polo shirt, Roll neck T-shirt, Cut&Swean T-shirt, Tank Top, Knitted night dress, Sweater etc, for men, ladies& children’s. GRAVILLE, CTM, A.B.FILIP, WIBRA, PROMOSIA, ZEEMAN. Monthly Capacity: 1.5 million pcs. 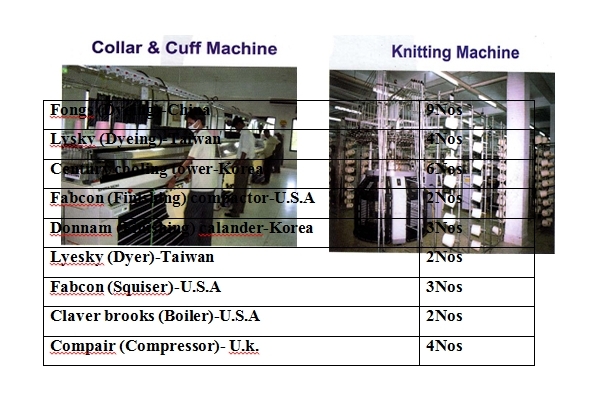 Origin of machineries: U.S.A. JAPAN, TAIWAN, KOREA, CHINA, GERMANY. 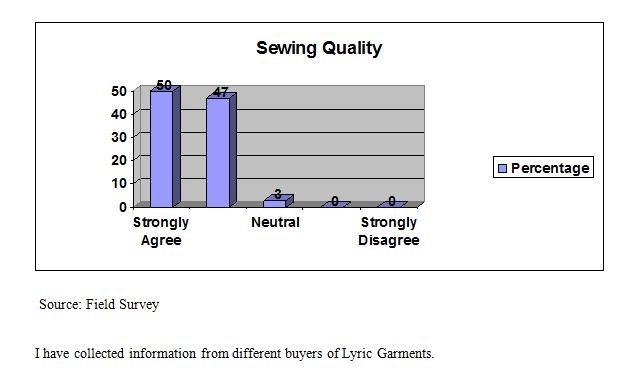 Sister Concern: Lyric Garments (pvt) Ltd. 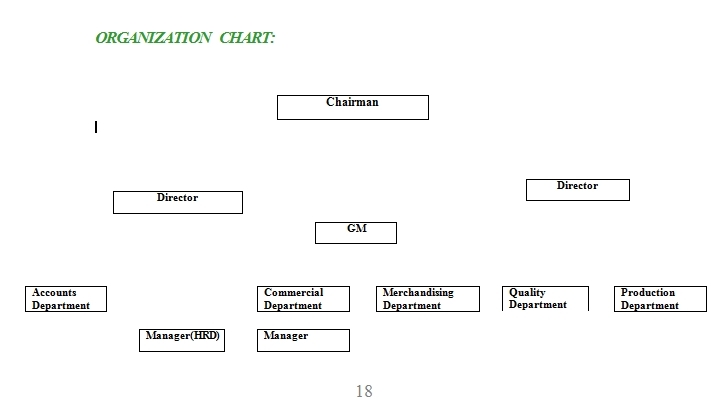 The over all management of the company will be vested with the Board 4f Directors. The Board of Directors will be formulated company’s policies & guide lines for its day to day business operations. The Managing Director will be the executive head who will look after the business affairs and other logistic supports of the economy. However Managing Director will be assisted by the managerial and technical personnel who will be the directors of the company. The most busiest and important branch of all branches of Lyric Garments is its Head Office which is situated in Chowdhurypara, Malibag, Dhaka. All types of important works are done by here. This Branch is a renowned enterprise since 1991 with import & export right that specializes for deployment of design & production of knitwear &sweeter. It is equipped with all modern machineries for knitting, fabric dying, yarn dyeing, sewing, embroidery, woven label, printing & packaging at the same premises. All types of buyers are handled from this branch. Nature of Business : Garments manufacturer and exporter. Product type : All types of woven and knit, top and bottom. 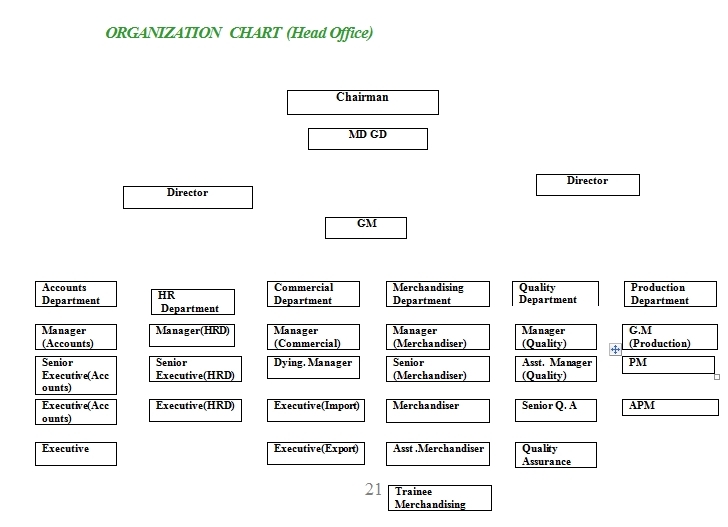 Every department of this Branch maintained by the functional manager. But the Chairman personally looks after every sector of this branch. In its factory there are some other departments are exists. As an internee I worked various sectors of this organization. Basically I worded in its merchandising sector as an internee merchandiser. This factory is situated at Malibag Chowdhuripara in Dhaka. There are nine hundred employees work in one shift a day of eight hours each and overtime system exists when need. The production manager checks out all of the equipments of factory. During the internee period I always worked along with senior merchandiser as like a shadow. I also always follow him carefully about his activities. In addition sometimes I also supervise the workers as an internship employee. I have done different types of functions with the merchandiser. Some functions are as follows. In several times I have to check buyers’ e-mail. 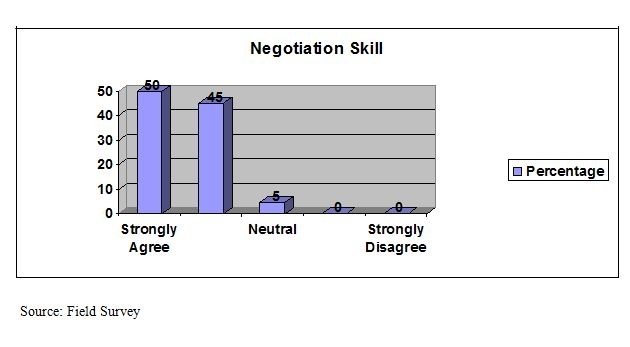 By this time I acquired knowledge about how to send and to check e-mail of the buyer. After final negotiation when the buyer makes order for sample design then I have to make swatch card with the merchandiser. In a swatch card the accessories of garments like fabrics, thread, button and zipper must be shown. During my internship program I have prepared different buyers swatch card like- At least sports wear, Bells outlet stores, JD Williams and Company, Peacocks stores. At the time of internship I have observe the sample design and try remove the sample problem. Sample design is the most important work of merchandiser. During the sample design measurement must be accurate. At the time of my internship sometimes I have to go storekeeper to adjust inventory. I have gather knowledge about inventory management. The store manager prepares inventory in two times after receiving the accessories and after sewing operations. In every step of production I helped the merchandiser and finishing is also important function of production. Accessories Collection is another important function of a merchandiser. In several times I have to collect different accessories from market such as zipper, button, ribbon, thread, elastic etc. Merchandising function and quality control are closely related in the RMG sector. Quality control is the most important function in the ready made industry. 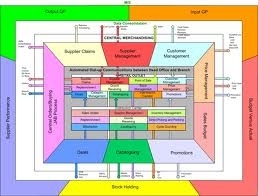 It controlled by the merchandiser directly or indirectly. I have take take part directly in quality function. I have to observe the quality and remove the problem of sewing. Sometimes I worked with the operator and try to understand their problem. What are the activities of merchandiser? How to deal with buyer? How to supervise the workers. The factory management and how it runs. Problem solving process at the work place. How the production process work? Learn about garments oriented raw materials and merchandisers. As I am a student of MBA and working in garments sector, as a merchandiser job experience will help in future. From this internship I have found that merchandiser job is more challenging and difficult from any other jobs. This internship period helps me better understanding about garments sector and if I develop my carrier in this sector then this experience helps me lot than any other fresh candidates. 2000 for their quality management system. Domestic annual ready made garments demand has an increasing tend. More orders are coming from buyers and so its demand is increasing and so price is also increasing. As an employee merchandiser’s job is vital and risky. 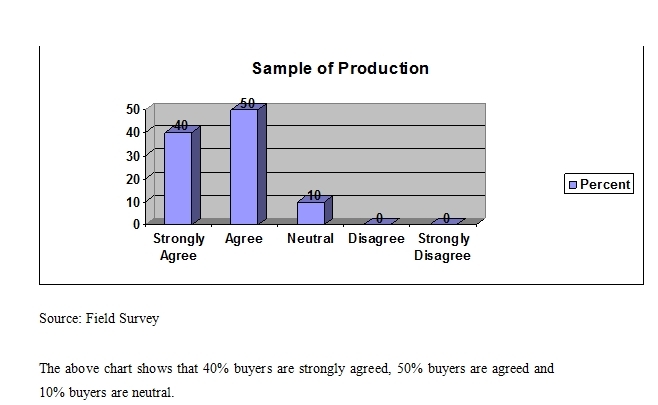 Because buyers satisfaction depends on merchandiser’s handling power. If garments deliver the products according to the buyers due time, responsible price and their demand able style then the buyers will come again, because they are satisfied. 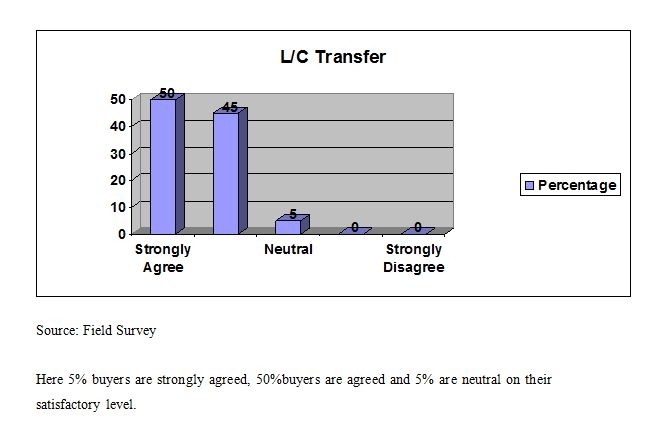 For this satisfaction of buyers, the responsible person is the merchandiser. The merchandising policy and practice should be increase in better way at Lyric Garments Ltd. The merchandiser should more intellectual and hard working. Product delivery should be maintained in time to time. Proper communication is very much important with buyer in garments industry. It must be maintain both before place and order and after place of order. They have some unskilled people in the factory level. So here Lyric Garments ltd must be recruit high skilled people with giving respective salary. Lyric Garments ltd has no website. So must be open a company website where people get information this garments company. T&D of this garment is much strong. The company should provide appropriate training to the workers so the workers can work more efficiently. The management power of this company should be decentralized as a result the lower lever manager could be able take decision quickly. The HRM division of this company is weak. So the company should take initiate stapes to strong the HRM division for the welfare of the company. Production anger should be educated and hard working. Manager must be leading the production channel through pre production planning. Quality controller may able to control standard production. So the quality controller of this company should be experienced person. Kotler, Philip, (1994) Marketing Management, 8th edition, New Delhi prentice hall of India Pvt. Ltd.
Zikmund William G (2000) Business Research Methods, 6th edition, Philadelphia: The Dryden press Harcourt College Publishers.